In certain situations, you must learn how to dial down your steadiness. This may occur when you must make split-second decisions. In these cases, it is necessary to dial down your steadiness to act quickly. In management positions or leadership roles within your team, you should dial down your steadiness factor in order to allow more extrovert-type behaviors to take effect. Although the steadiness factor can help you be thinking about situations, it can hinder you from adequately taking command and taking action. You need some degree of assertiveness in order to fulfill leadership duties; such as delegating tasks and dealing with conflict. It is imperative that you improve your ability to give and receive feedback, too. An example of this can be found when instructing young children. Young children have a short memory and when they do something wrong, you need to let them know right away or they will forget what they did and will not understand why you are instructing them. The steadiness factor can hinder this ability because it is an introverted factor, meaning that it obstructs effective communication between others. Even though the steadiness factor is people-oriented, it is more introspective. Dial down this factor and use it in tandem with the more extroverted factors for effective management and leadership. Conflict is the other major problem with the steadiness factor. There is an unwillingness to deal with problems or differences. Which can cause someone with an elevated steadiness factor to become passive aggressive? If you can’t get your feelings or ideas out in the open, they might build up and cause resentment toward the people or person that you aren’t able to express your true thoughts. This can cause serious problems in work and personal relationships and cause unwanted stress. Take note of any situations in which your steadiness factor may be hampering your proficiency to accomplish your tasks and responsibilities. As you begin to mark areas of your life in which to dial down your steadiness factor, take note of these immediate steps that you can use to build your skills at situationally behavioral flexing or with long-term behavioral morphing. Focus on the actions you need to take. Occasionally, multi-tasking can be a waste of time and detrimental to performance; even causing stress and fatigue in the long run. Focusing on what you need to get completed can help your productivity and relationships. Although you may want to stop and talk to your coworkers and be thoughtful, to get things finished, you must put others on the backburner to complete your tasks. Close your door and focus on what’s on your plate. Just get it done! You may find it helpful to set a specific period of the day to focus on your work materials and make that time known throughout the office. If others recognize that you are unavailable during certain points in the day, you will find yourself completing more work and achieving more of your goals each day. In this way, they will still think you are thinking, but you just need time to work without interruptions. Too many times individuals with a high Steadiness factor will tend to hold in their thoughts and feelings, causing resentment and bitterness to build up. Being able to communicate your thoughts, forgiving a person that has wronged you, and moving on will help lower unwanted stress and allow you to focus on the many positive aspects of your life. Resentment and bitterness can also hold us back from achieving our goals because we are so focused on what another person said or did to us and how it hurt us, that we lose focus of our original goals and objectives. Learning to forgive and forget can help you regain that focus and press on to achieving success in your life. How someone is able to forgive and forget is unique to each persona’s situation; however, communicating your hurt is a key step in that process. Communicating your hurt maturely allows you to let the other person know that you hurt them and gives them the chance to explain themselves. Allowing others to apologize and realize that everyone is human and makes mistakes are other areas that are important in the process of forgiving and forgetting. You may be getting comfortable in your routine and what you do; try something new! Change can be an extremely good thing! When a person sticks to the familiar they give up on the infinite possibilities and outcomes of any circumstance or opportunity. Trying new things will challenge you and can lead you to a level of success that you never thought possible. Try taking a class or simply go to a new restaurant. Take a break from your routine and get out of your normal habits. You could even try to take on a new responsibility at work. This will show initiative and earn you respect from your bosses or peers. If you continually show this type of behavior, people will come to you with new tasks that will inevitably enhance your career. Now let’s look at the story of Liz Claiborne. What do you do if you’ve invested sixteen years of your life with a company and your ideas for change are disregarded? Just ask Liz Claiborne. Claiborne was a clothing designer with the Jonathan Logan Company. She believed their limited variety of patterns and sizes were insufficient to meet the changing needs of their market. Efforts to convince management that body types and style preferences warranted innovation in design fell on deaf ears. Undiscouraged, Claiborne became a vehicle for stylish and affordable woman’s apparel by starting her own company. Her versatile designs appealed to the growing number of women in the workforce and to store buyers. Liz Claiborne, Inc. experienced enviable growth throughout the 1960s, 1970s, and 1980s, ultimately attaining the number-one position in the woman’s fashion industry. The example that Liz Claiborne exhibited shows that coming out of your routine or comfort zone can push you to new heights, personally and professionally. People with elevated Steadiness tend to get what is known as analysis paralysis. They become paralyzed by fear because they think so deeply, and they conjure up all manner of negative consequences that they never even try to take a step forward. This can cause someone to miss an opportunity to reach their goal. If your boss offers you a project and you haven’t done anything like that before, take the chance on it and try to achieve success. You may feel uncomfortable risking something and entering unfamiliar territory, but it will help you to learn how to dial down your steadiness. Let’s look at the story of Charlie House. Charlie House took what many would consider the ultimate risk. As head of corporate engineering at Hewlett-Packard, he ignored an order from co-founder David Packard to stop working on a high-quality, large-screen video monitor. Charlie pressed on. The monitor has been used in heart transplant operations as well as space travel. Seventeen thousand of the units were sold instead of the projected thirty, and Hewlett-Packard gave House a medal in 1982 for extraordinary contempt and defiance beyond the normal call of engineering duty. He took a calculated risk, made a decision, and took action. Calculated risks will lower your steadiness factor because of the initiative and assertiveness that risks require. For risks to occur, you need to make assumptions. An assumption is when a person thinks that a cause, a situation, facts or data are correct, but they cannot or have not yet uncovered irrefutable evidence to prove them true. We make assumptions every day. When we leave for work in the morning and see that it is sunny, we assume that it isn’t going to rain and that we don’t need our umbrella. Assumptions are a part of life but making erroneous or false assumptions can be extremely detrimental to the decision-making process. It is highly recommended that you visit and review the Decision-Making Course and the Session entitled Analyze Options. Complete the Threat Mitigation of Fear Activity in Session #7 of Part 2 of the Life Skills Course. It’s important to understand why people are wary of change in the first place to begin to dial down your steadiness factor. You have to go through the Transitional Time Line and determine what your behavior looks like in each of the ten phases. As you learn how to deal with denial, the depths of suffering, commitment, achievement, and the other phases, you will gain better insight into human behavior, both in yourself and in others. People tend to get stuck in phases and halt their forward movement through the Time Line. It is important for the high S to propel themselves into the decision-making phase of the Transitional Time Line. It is too easy for an individual with an elevated Steadiness factor to become stuck in the Narrowing Options phase, which is right before the Making Decisions phase. Spending too much time in this phase will keep a person from accomplishing their goals and achieving success. Learning about the different phases of the Transitional Time Line may help you become more open to change and truly adapt to your environment. Something that can hinder being open to change is what is known as hindsight bias. It is the inclination to see past events as being predictable. It sometimes occurs in reaction to a surprise and is used to try and cover up the embarrassment of not being aware of anything that foreshadowed the occurrence. When a person exhibits this bias, they can refuse to learn from making a bad decision because they saw it coming all along. When this happens, they are likely to carry on repeating the same mistakes. It is important to check your biases so that you don’t continue making the same mistakes and become resistant to change. You can review the Transitional Time Line in our Change e-Learning Course. This course provides materials that will help you dial down your steadiness factor. Allowing you to become more open to change. The steadiness factor usually locks you into a certain belief pattern or a particular way of doing things. In order to adapt your behavior to different situations, you must become flexible. Flexibility allows you to utilize different sub-factors in different situations which can help you achieve success in life and work. Dialing down the steadiness factor will open your mind to many more paths and approaches to accomplish your goals. Flexibility entails practice, but your mind can accomplish it quickly if you become determined. Learn to focus on becoming more flexible and you will find plenty of success throughout your life. After practicing the immediate steps to dialing down your steadiness factor, there are several secondary steps recommended to help you improve your ability to dial down the steadiness factor. If you have to make a decision quickly, think about the most important criteria required to make an acceptable decision. When you need to make that decision for yourself, you need to have a keen sense of where you want to go, not where other people want you to go. Trust your gut and make the decision on the best possible options. There are times in life and work where you have to make a quick decision. Having this skill set will benefit you as you work toward achieving your goals. This may seem hard to do but it’ll get easier as you practice more. When you’ve been working steadily on something for a long time, take a break and complete some of your smaller tasks. Occasionally, a break can help clear your mind and allow it to relax before starting the major project again. You have to establish a balance between your determination to finish your most important tasks and your smaller responsibilities. Taking a break at work is extremely important for your physical and mental health and it can also have a positive impact on productivity and performance. Taking periodic breaks if you work at a computer helps circulation throughout the body, can lower heart risks, lowers stress and helps you from becoming burned out. Understand that breaks are needed to help you refocus and re-energize not only your brain but your body as well. Breaks aren’t just needed in the workplace, though. Taking time to refocus while around family or friends can help strengthen your relationships and keep you balanced. Observing and learning from someone showing different behaviors and diverse modes of thinking help you develop your behavioral flexibility. Studying a mentor’s actions and mindset gives you insight into developing new skills and can help you learn from their experience so that you don’t have to make the same mistakes they did. More than just viewing your mentor’s behaviors, the mentor will scrutinize your actions and give you a valuable perception of yourself. Then you can begin to improve and adapt your skills to fit the situations in your life. 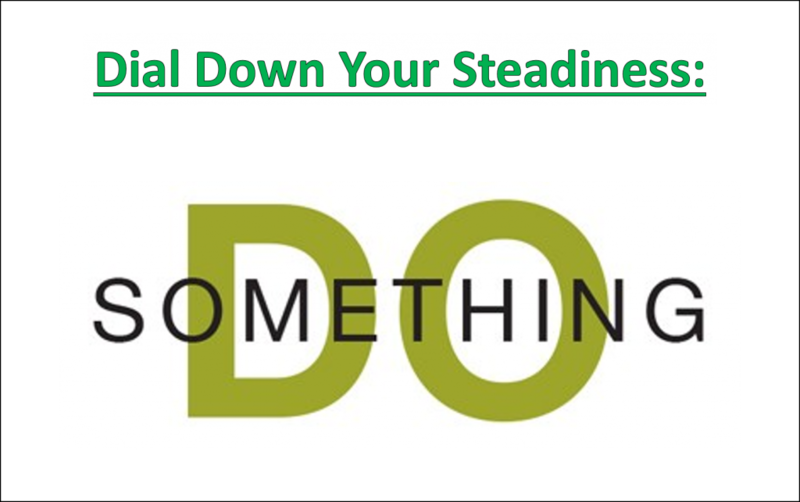 Since the steadiness factor is people-oriented, you must dial down your steadiness if your job or life requires you to be task-oriented. If you become more task-oriented then your productivity can increase. Your stress levels can then decrease. This may only be for a limited time or a few minutes, but you need to know how to situationally flex in order to progress. A task-oriented focus is the characteristic of the dominance and compliance factors. Simply dialing up those factors may be enough to dial down your steadiness factor. Review Indaba’s DISCflex eLearning to learn more tactics to dial down your steadiness factor. If your goal is to dial down your steadiness factor to the optimum level, make sure you complete the activities in the activity section. I hope you have enjoyed the steps on how to dial down your steadiness factor. Be sure to incorporate each of the four primary factors into your life as the situation warrants. Behavioral flexibility is the key to your success. Providing DISC Behavior Assessments to Leadership, Managers, Coaches, Teams to make understanding the impact of behavior easy!